Jama Masjid of Delhi is the largest mosque in India. The Jama Masjid stands across the road in front of the Red Fort. Built between 1644 and 1658, Jama Masjid is one of the last architectural works of the Mughal emperor Shah Jahan. The spacious courtyard of the Jama Masjid holds thousands of faithful. Jama Masjid is located on a mound in the heart of the old city and projects beautifully into the Old-Delhi skyline. 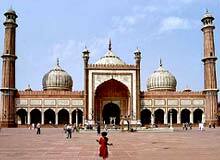 Jama Masjid Mosque was built in red sandstone and marble by more than 5000 artisans. Originally called the Masjid-i-Jahan-Numa, or "mosque commanding view of the world", the Jama Masjid stands at the center of the erstwhile capital city of the Mughals, Shahjahanbad. The Jama Masjid was completed under the supervision of Saadullah Khan, the Prime Minister of Shah Jahan. A sum of Rs 10 lakhs was spent on the construction of the Jama Masjid. The Jama Masjid is built on a red sandstone porch, about 30 feet (10 m) from the level of the ground and is about 1400 square yards (1200 m²) in extent. The Jama Masjid has three gateways, four towers and two minarets. The gateways in the north and south are led by a fleet of steps. The main entrance is on the eastern side facing the red fort. It was probably used by the emperors. The tower of the Jama Masjid is made up of five distinctive storeys. Each one of the storeys has a projecting balcony. The adjoining edifices are beautifully done with calligraphy. The first three storeys of the Jama Masjid tower are made of red sandstone and the fourth one is made of marble, while the fifth is made of sandstone. The Jama Masjid is covered with intricate carvings and has verses inscribed from the holy Koran. The grand Red fort (Lal Qila) stands on the eastern side of the Jama Masjid. The main prayer hall of the Jama Masjid is made up of high cusped arches and marble domes. The cabinet in the north gate of the Jama Masjid contains a collection of Muhammad's relics - the Koran written on deerskin, a red beard-hair of the prophet, his sandals and his footprints, implanted in a marble block.